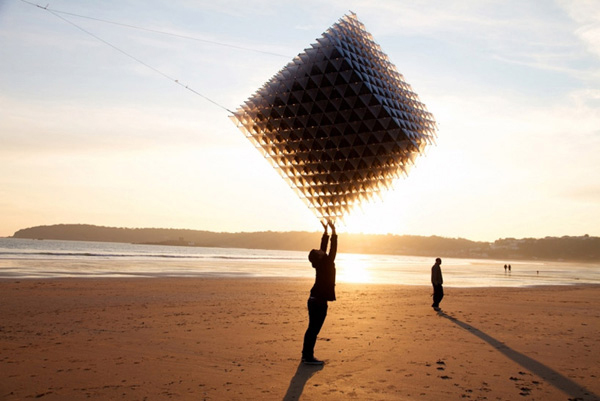 Heather and Ivan Morison have utilized 3D printing technology to create a beautiful geometric sculpture that doubles as a kite. It is comprised of over 23,000 pieces held together by 3D-printed nylon connectors. Built in conjunction with London architectural designer Sash Reading and Birmingham fabrication design studio Queen & Crawford, the cubic sculpture resides in the atrium of Dandara’s new Castle Quay development in St. Helier, Jersey. The Morison’s are known for their innovative outdoor installations, and their newest, “Little Shining Man” adds to their reputation. 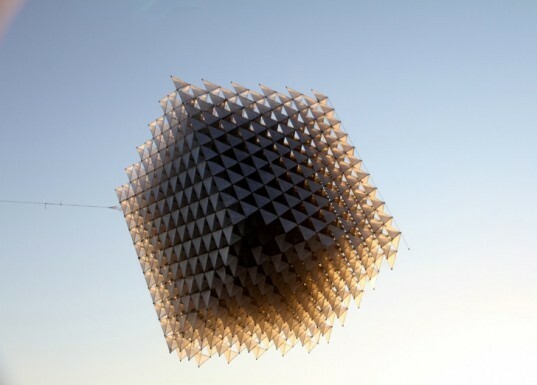 Inspired by Alexander Graham Bell’s tetra kites, the 3d printed design flies with few problems due to its lightweight materials and symmetry.Three cubic segments form the final piece. A fine balance of strength and weight had to be achieved so that the kite would fly but not be damaged when it returned to the ground. The team found the perfect solution by using carbon fiber rods and Cuben Fiber, a handmade composite fabric commonly used in racing yacht sails. Queen & Crawford designed a nylon joint to connect each of the 23,000 pieces. With the help of 3TRPD, the team was able to use Rapid Prototyping technology to quickly produce and test out the design. Each piece was individually assembled by hand and took over 16 months to complete. Dandara, the firm the “Little Shining Man” now calls home, promises to take it out once a year to fly it in local St. Aubin’s Bay. The Morison's are known for their innovative outdoor installations, and their newest, "Little Shining Man" adds to their reputation. Inspired by Alexander Graham Bell's tetra kites, the 3d printed design flies with few problems due to its lightweight materials and symmetry.Three cubic segments form the final piece. A fine balance of strength and weight had to be achieved so that the kite would fly but not be damaged when it returned to the ground. The team found the perfect solution by using carbon fiber rods and Cuben Fiber, a handmade composite fabric commonly used in racing yacht sails. Queen & Crawford designed a nylon joint to connect each of the 23,000 pieces. With the help of 3TRPD, the team was able to use Rapid Prototyping technology to quickly produce and test out the design. Each piece was individually assembled by hand and took over 16 months to complete. Dandara, the firm the "Little Shining Man" now calls home, promises to take it out once a year to fly it in local St. Aubin’s Bay.